Diamond Professional Oak Pool Table - 7ft, 8ft, 9ft | Free Delivery & Installation! The Diamond Professional Oak Pool Table comes with Free Delivery and Installation (worth £500), over £250 of Free Accessories, and is exclusive to Home Leisure Direct. The Diamond Professional is an American pool table using 2 1/4" size balls. It uses a single piece slate bed for all size options which are 7ft, 8ft or 9ft. The Professional is Diamond Billiards' most popular table, and it's easy to see why, with its precision fitting frame. Developed by professional players with skilled engineers and designers, the Professional meets or exceeds all specifications from the Professional Billiard Tour Association, and is used at major sanctioned tournaments across the United States. The Professional is performance-engineered to provide exceptional play capability in either commercial or private usage. Manufactured by experts in the United States, the Professional is quite simply one of the best tournament tables in the world. The Professional is available in 7ft, 8ft or 9ft sizes using a single slate design. It is fitted with high grade tournament quality Simonis cloth as standard, and there is a huge choice of table finishes available, enabling you to get just the look you are seeking. Using that input to implement features and refinements that improved its performance. These refinements included continuously changing various specifications which determine the degree of difficulty or ‘tightness’ of the pockets, such as the cut angle and pocket size, to find just the right configuration. Since its inception, the Diamond Professional Pool Table has been through over 100 major tournaments and many changes and refinements. Because the Professional was truly designed by players for players, and not by manufacturers, it contains design features found in no other table in existence, which make the Professional the standard of the industry for tournament play, commercial pool rooms and the home. Every facet of a Diamond pool table is manufactured to exacting standards. Carefully sculptured from solid hardwoods, each table is pre-assembled at the factory by hand and tested to assure that strict specifications are met. These rigid specifications and the large amount of hand craftsmanship mean that Diamond tables will never be mass production units. Each will be produced only at a volume that assures the very highest quality for every unit. Diamond craftsmanship and philosophy encompasses each element of any single game of billiards, including the lighting, the balls, the cloth and even how comfortably the players sit between runs on the table. As befits a Diamond, the understated elegance of the wood-matched Diamond table lighting fixtures is uniquely simple; a light designed to uniformly illuminate the entire playing surface thus eliminating all shadow. The light focuses attention on the entire playing area without drawing attention to itself. The Diamond Professional is exclusive to Home Leisure Direct in the UK. We are extremely proud to be able to offer these stunning pool tables, which look amazing and provide professional quality playability. For American Pool, Diamond tables make a superb choice. If you fancy checking out one of these fantastic Diamond Pool Tables in the flesh, then pop into our showroom in Bristol. We have the 8ft version of the Pro-Am, made in black. Playing a game on this table will allow you to get a real feel for the quality of a Diamond pool table. For more models from this manufacturer, please see our Diamond Pool Tables page. If you would prefer to have a higher grade of accessory pack you can upgrade to the Pro-Cup kit - see "Customise and Buy" section at the top right of this page for prices. This Diamond pool table is supplied with Aramith Spots and Stripes as standard. Aramith Spots and Stripes Balls - tournament grade balls, supplied numbered from 1 to 15, allowing you to play either 8 Ball or 9 Ball pool using the same set of balls. 2 1/4" size. This table is available in 7ft, 8ft and 9ft sizes. 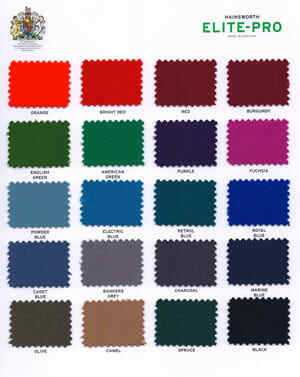 Check out the Image Gallery above for sample colour options or download the swatch card by clicking the link below. If you would like us to post you a swatch card just give our friendly sales team a call on 0800 622 6464 or 01454 413636. Add Diamond's Dymondwood Rails to the edges of your Diamond pool table for the best look available. You can add an overhead lighting rig, designed and manufactured by Diamond to beautifully match their tables. Please ensure that you choose the correct size of overhead light for the table size you have chosen, using the drop-down menus at the top of the screen. Diamond don't make any units to function on 240v, so you are buying the shade unit and diffuser only. You will need to organise your own suitably qualified electrician to source and fit the lighting components. If you are unsure of what options to choose please call us to discuss the options available on 0800 622 6464 or 01454 413636. If you are happy to proceed we can take your order over the phone.